From July 1994: the first issue of the very short-lived return of the Barbarian: the first (of only three) issue of Marvel UK's CONAN THE ADVENTURER. This full-colour fortnightly was the last time that Marvel UK published the character, ending a long, albeit intermittent, run that stretched all the way back to the first issue of SAVAGE SWORD OF CONAN weekly nineteen years earlier. That first volume was a dud but greater success was to be found as a supporting feature in THE AVENGERS weekly followed by runs in MWOM, POTA, MARVEL COMIC, VALOUR, FUTURE TENSE AND VALOUR and HAVOC. He did, of course, also regain star billing in the long-running monthly reboot of SAVAGE SWORD and in the considerably shorter-lived CONAN POCKET BOOK. This new run, coinciding with the animated series of the same name (although the strips were vastly different to the game kid-vid, which may have surprised a few parents) reprinted (again) the first issue of the US colour comic book and the first part of a serialized reprint of the sixth Conan (US) annual. 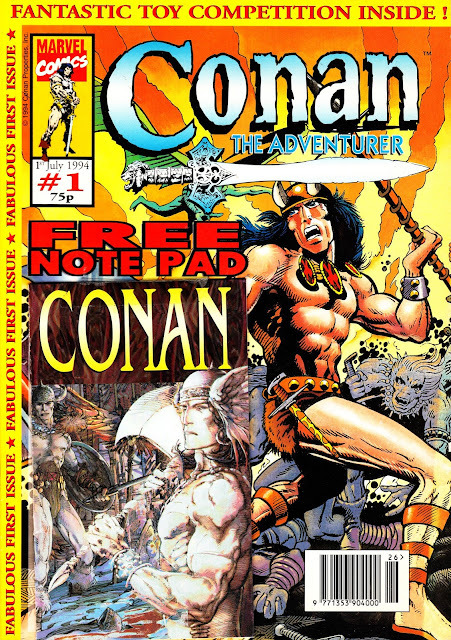 I'm not sure how a Conan notepad sits with the franchise but I was chuffed to find this issue with the unique gift still attached. The last issue, now called simply Conan for reasons possibly no more mysterious than aiding the cover layout, hit newsagents in mid July. It didn't announce its own demise.